Tusk and ball, placed upon metal necked hooks are aligned alongside each other on a quality wooden wall mount. 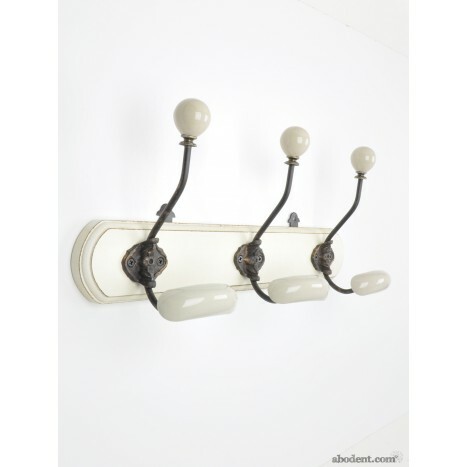 The mix of wood, metal and ceramics creates a quality, traditional and ornate wall mounted coat rack. The large size and rounded shape of the ceramics tusks help to decrease the chance stretching of leaving marks on delicate or heavy garments. Tags: three hook coat racks, ceramic and wooden coat rack, ceramic ball coat rack, wooden coat racks, cream coat racks, metal wood and ceramic coat racks.